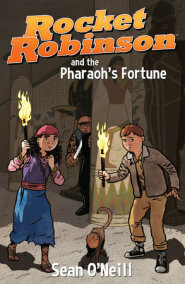 Rocket, Nuri, and Screech return in the second volume of the Rocket Robinson series. This time, they find themselves in the French capital, where a rare and mysterious painting from the middle ages has been stolen from the Louvre Museum–and Nuri’s uncle is the prime suspect! The young adventurers are soon hot on the trail of the stolen artwork–a trail which leads to a pair hapless French thieves, a secret cabal of merciless German spies, a shadowy secret temple, and an ancient medieval castle! But this is no ordinary painting… the secret contained within may lead all the way to the most mysterious and sought-after treasure in history.